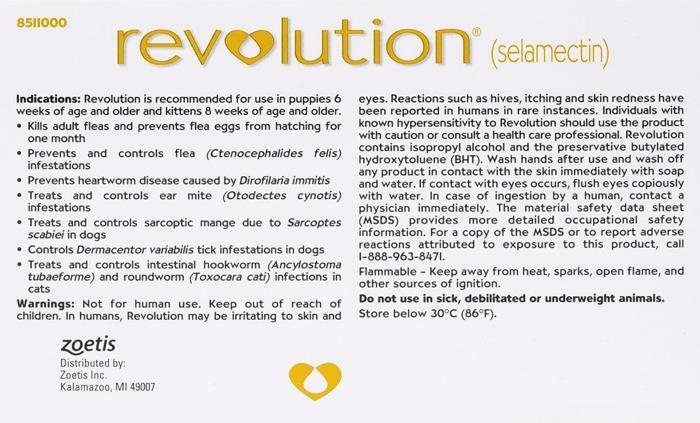 Revolution Pink for puppy and kittens prevents heartworms, fleas and other harmful parasites. *NO PRESCRIPTION needed for this item. This is an excellent tool in the fight against a myriad of the common parasites that attack the fuzziest of your companions, and no multiple pet household should be without it. I have a 4 lb schnauzer, I purchase the under 5lb revolution for her. It says it's for puppies and kittens, is it still okay for me to use on her since she is done growing and this is her max weight? I want the three pack because my dog is only 8 weeks old but the three pack says it,s for kittens. Is it okay for puppy's ? It is ok for both puppies and kittens. It contains 6 tubes which is 6 month supply. Revolution- Is this only available in a 12 pack. Bought in a 3 pack on a monthly order. Purchase the 5 pound for dogs. good product ! affordable price ! free shipping ! Great ! !